Jamestown, NY (August 6, 2018) – About 30 years ago, just before Lucille Ball passed away, she told her hometown of Jamestown, NY that rather than a museum celebrating her life, there should be a place that celebrates all comedy. This past weekend, that vision was realized with the grand opening of the National Comedy Center. 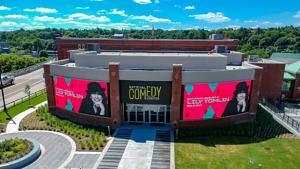 The National Comedy Center is now the first non-profit cultural institution and national-scale visitor experience dedicated to the art of comedy. This new 37,000 square foot, $50 million facility tells the story of comedy from its origins through the present, with more than 50 immersive, interactive exhibits and rare comedy artifacts. The Grand Opening week-long celebration featured Amy Schumer, Lily Tomlin, a tribute to the original Saturday Night Live cast with Dan Aykroyd, Laraine Newman and writer Alan Zweibel, Fran Drescher, Lucie Arnaz, Laugh-In producer George Schlatter, comedians Lewis Black, W. Kamau Bell, Judy Gold, and more. In total, the opening celebration featured more than 50 events and 40 artists that included the innovators, creators, and legends of comedy with thousands of visitors in attendance from across the country. The celebration kicked off with a ribbon cutting ceremony by New York State Governor Andrew Cuomo, and was highlighted by Dan Aykroyd riding his motorcycle to the front door of the National Comedy Center, and then donating it to museum. Family members and representatives of legendary figures in comedy were in attendance, including Shelley Berman, Lenny Bruce, George Carlin, Ernie Kovacs, Andy Kaufman, Rose Marie, Harold Ramis, Allan Sherman, Jonathan Winters and Rusty Warren. “It’s incredible,” expressed Lily Tomlin, who toured the Center at midnight after her sold-out performance. “I’m really grateful that the National Comedy Center exists. It felt good to believe that our legacies will be remembered,” concluded Schumer. “So proud and grateful to be a part of the National Comedy Center. The entire museum is fantastic. Come to Jamestown and check it out,” remarked Harold Ramis’ daughter Violet Ramis Stiel. Lucie Arnaz said, “My mother would be over the moon with joy that her hometown decided to follow her advice and, instead of erecting some passive monument to her, pay homage to the healing power of love and laughter, the remarkable, life-saving tonic that is humor. Celebrate it. Study it. And find out how to make sure there is always more of it. The National Comedy Center will do just that in her memory." “From now on, when anybody says they want to get into comedy, I’ll tell them that the first thing they should do is come here,” said Dan Aykroyd.